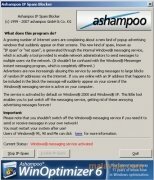 Windows operating systems have an integrated messaging system, that should really be used by the network administrators to send customized messages to any computer that is connected to that network, nevertheless, it is often used to send SPAM, because it is shown as a pop-up window that we can't avoid reading. 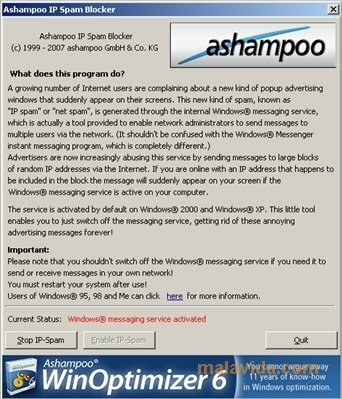 But with Ashampoo IP Spam Blocker we can get rid of this problem. 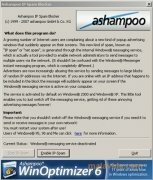 This system is called Windows Internal Messaging, and to use it you need to open the command console, and with the "net send" command, the receiver's IP and the message, send them the message that we want. This text is shown in the middle of the screen interrupting the receiver. To eliminate this problem, the best idea is to download Ashampoo IP Spam Blocker. Basically, what this program does is block the messages that reach our IP by means of the "net send" command, because even though they where very useful in the past, the current spreading of instant messaging applications and emails make it totally dispensable. It only works on Windows XP or earlier versions.